We love eating dinner from the grill just about any time of year, unless it is snowing- no thank you! Grilled Turkey Burgers are a great choice for my family because EVERYONE will eat them without complaining or crying. 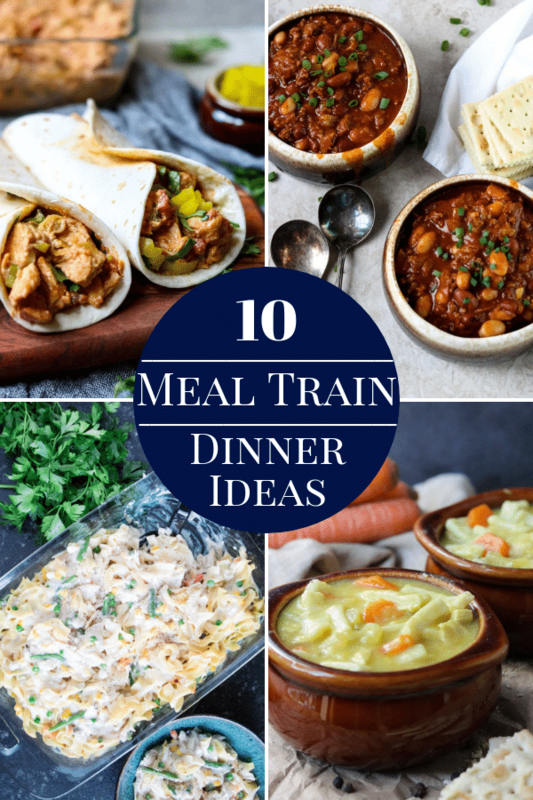 Anyone else familiar with meal time battles?! I know I am not alone! 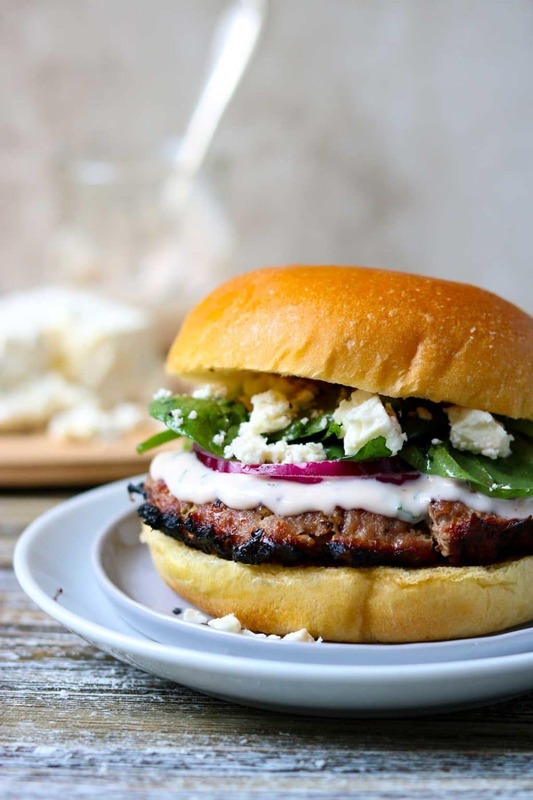 My Greek Turkey Burger with Raspberry Mint Aioli is a deliciously juicy grilled turkey burger topped with tangy feta cheese, red onion, and baby spinach dressed with a slightly sweet raspberry vinaigrette. It is then topped with an amazing Raspberry Mint Aioli sauce, which is mayonnaise mixed with a touch of raspberry vinaigrette, a little garlic, and a hint of mint. 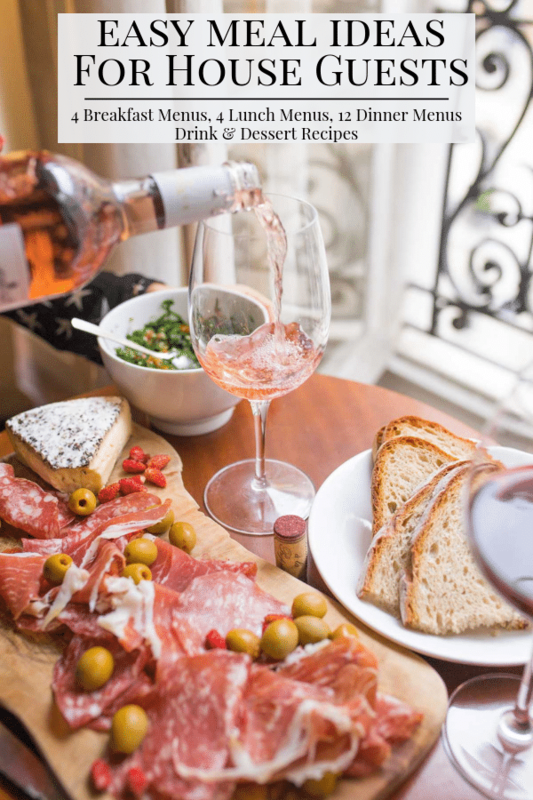 The name of this recipe sounds like it could be super complicated … but that could not be further from the truth! I keep this grilling recipe easy and delicious! Start by prepping your grill of choice- charcoal, gas, green egg… or a grill pan indoors works too! 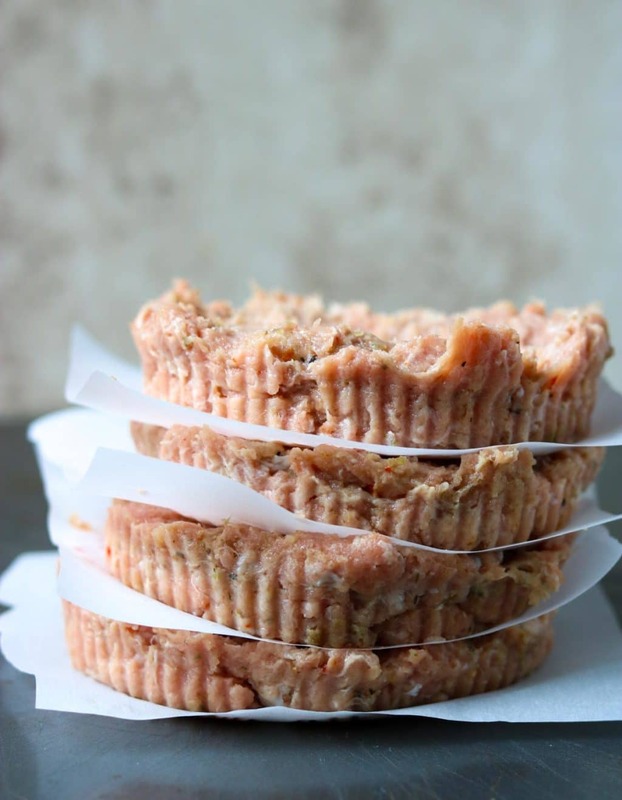 Meanwhile, with clean hands, lightly mix together the 4 ingredients for the turkey burgers: ground turkey, italian dressing packet, oregano, and plain greek yogurt. Then form 4 equal patties. Here is a great kitchen tip when making burger patties: Use a round cookie cutter to shape your patties evenly (see the pictures below, obviously mine is fluted). Also, lightly press your thumb into the middle of each patty. This will help prevent your burgers from turning into shrunken hockey pucks! I like to oil the grill grates before grilling turkey burgers. It will prevent them from sticking to the grill. Now grill the turkey burgers until they are cooked thru, 165 degree internal temp. Time to prep all your toppings. I like to buy a block of feta cheese for this recipe. It is creamier and fresher than the already crumbled feta. It is up to you if you like it sliced or crumbled. Thinly slice the red onion and then run them under cool water for a couple seconds. This will eliminate the enzyme that makes the onion flavor stay with you for HOURS. It will also mellow the red onion flavor, you will still be able to taste it, but it will not overpower all the other tasty ingredients. Put the spinach in a bowl and toss it with a generous amount of your favorite store-bought Raspberry Vinaigrette. This sauce may sound fancy, but it is super simple to pull together! Aioli is simply mayonnaise seasoned with garlic and additional flavors. 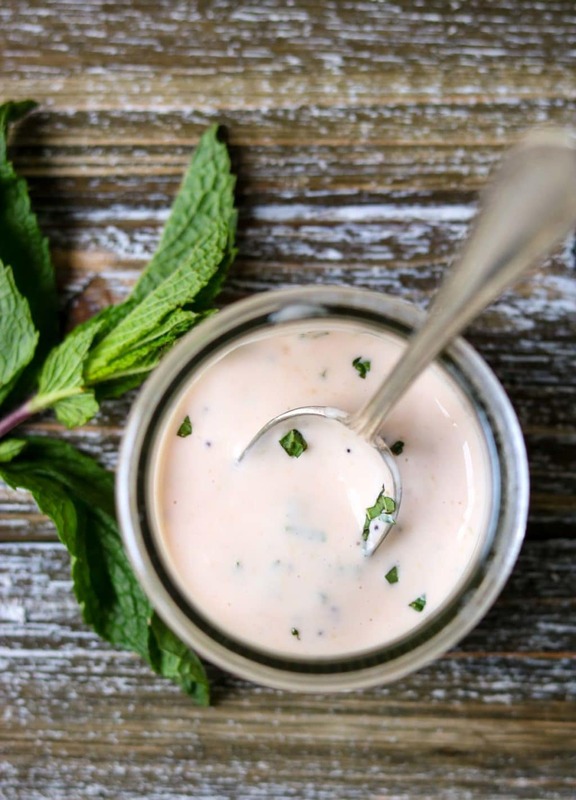 You make the Raspberry Mint Aioli by mixing together the mayo, 1 tablespoon of raspberry vinaigrette, garlic powder, and just a titch of chopped fresh mint. Stir it until it is complete smooth. Top the warm turkey burgers with the Raspberry Mint Aioli, red onion slices, feta cheese, and the dressed spinach. Enjoy! 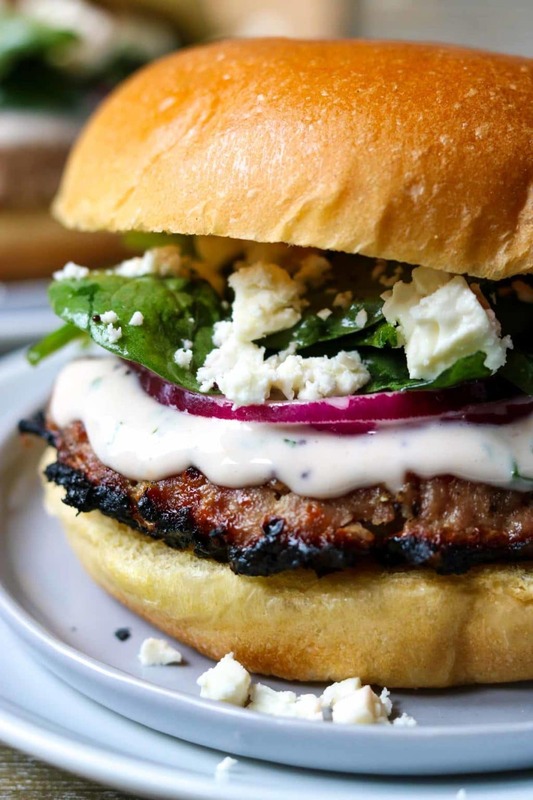 Instead of the Raspberry Mint Aioli, top the burger with a tangy Tzatziki sauce. Dress the spinach with a Greek Vinaigrette instead of Raspberry Vinaigrette. Add some grilled onions and peppers to the burger. If it is not “grilling weather” try grilling the burger inside in a grill pan. I have done this and it works great! This Greek Turkey Burger is great with a side of hummus and some pita chips, pretzels, and cucumber slices. 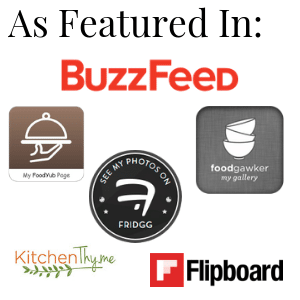 You could also make a tabbouleh salad- Near East has a great mix that is easy and delish! I hope you give this recipe a try in your kitchen (or on your grill!). 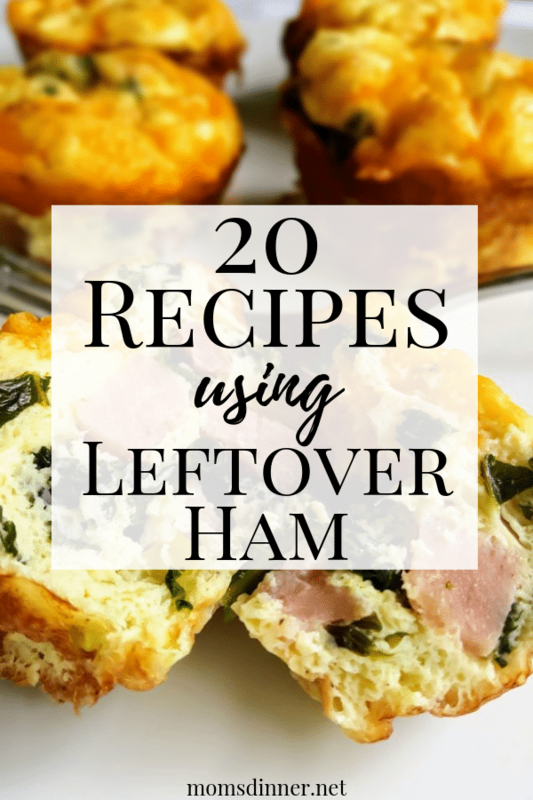 SAVE THE RECIPE FOR FOR LATER. PIN IT HERE. Bursting with Flavor.... 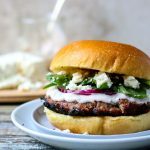 This Grilled Greek Turkey Burger with Raspberry Mint Aioli is super easy to put together and is made with easy to find ingredients. 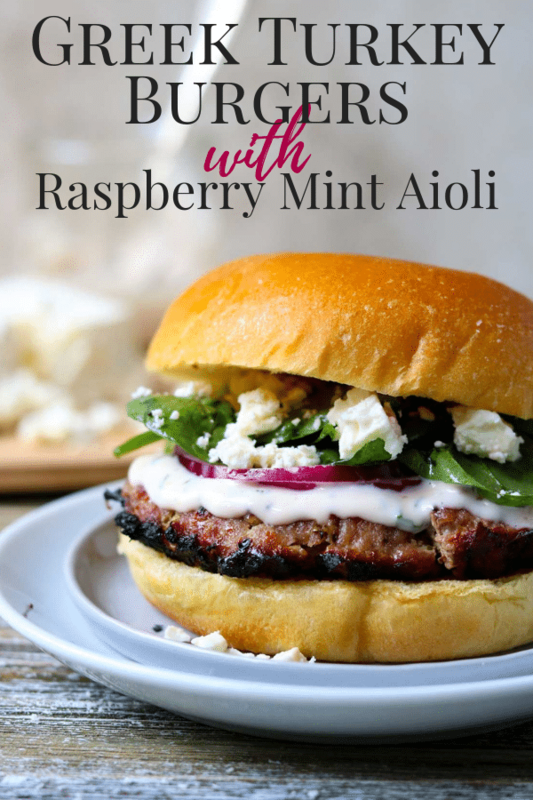 The Raspberry Mint Aioli is the topper to this turkey burger and it is simply made with mayonnaise, store-bought raspberry vinaigrette, and fresh mint. This is a great dinner on the grill. With clean hands lightly mix together the ground turkey, dried oregano, plain greek yogurt, and the Italian Dressing Mix packet. Grill the turkey burgers until they are cooked thru completely, reaching 165 degrees in the center. In a small mixing bowl stir together 2 tbsp mayonnaise, 1 tbsp raspberry vinaigrette, 1/4 tsp garlic powder, and 1/2 to 1 tsp fresh chopped mint. Toss the baby spinach with a generous amount of raspberry vinaigrette. Slice the red onion into thin rings and rinse under cool water for a few seconds (this will eliminate the strong onion flavor that says with you for hours!). 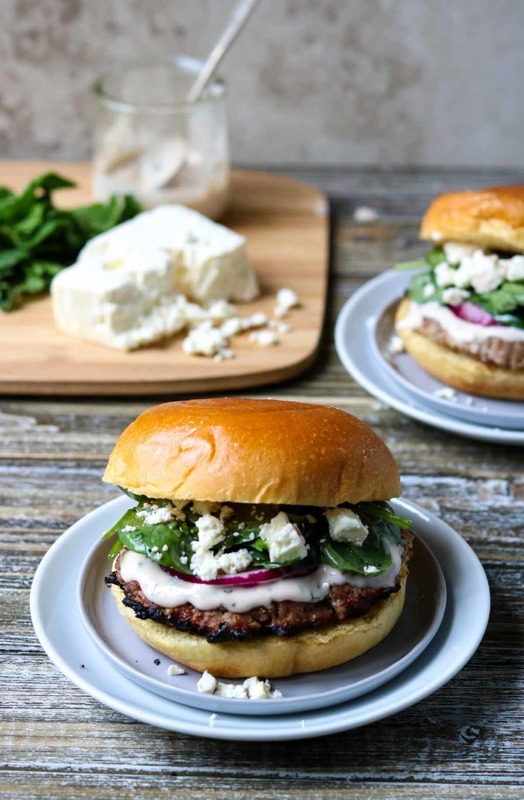 Place the greek turkey burgers on the buns, dress each burger with desired amount of Raspberry Mint Aioli, top with sliced red onion, dressed spinach, and feta cheese. Love this burger. The tiniest mint flavor is perfect with the raspberry in the aoli!